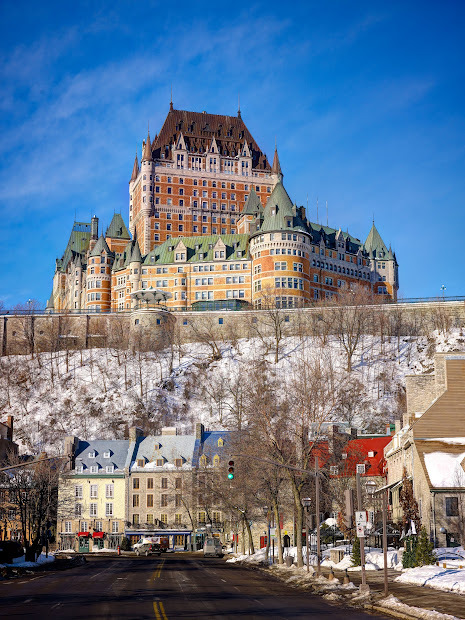 While my first priority in accommodations on a ski/snowboard vacation is that the place is quiet and clean, the hotels I stayed in during my trip to Quebec City and the Charlevoix region were worthy of some attention on their own. The Chateau Frontenac is an imposing building, at the top of bluff above the St. Lawrence River. You can take several flights of stairs down to the river, and to a small and charming shopping district. There’s also the Place Royal, the original site of the city. It’s over 100 years old, and looks much older. It screams “luxury hotel from a long time ago,” but it’s definitely serviceable. The owners have been updating it, though, with over $70 million dollars in work to both the lodging rooms and elsewhere. The closest lodging to Mont Sainte Anne is the Chauteau Mont Saint Anne hotel, at the base of Mont Sainte-Anne. There is also a separate building called Espace Nordik, which is where I stayed. The concrete bones of the building are definitely visible. Here’s a view of part of the studio condo I stayed in. It was within walking distance to the gondola, but the sidewalk we took was treacherous. Overall, I thought the place was too dark for my preference, but you can can see more photos on Facebook, and see the hotel website for yourself. Hotel La Ferme is an ultra-modern hotel placed in the shell of a former barn. While the hallways may give off the impression of a barn wall, everything else about the hotel is modern, including the radiant heat in the floors. For more photos on this hotel, follow this link to Facebook. Though this hotel is nowhere near the slopes, it was our “near the airport” hotel. Like La Ferme, it too, was ultra-modern. It was perhaps “too modern,” making wonder at times what was going on: How do I turn off the electric fireplace? How do I turn on the faucet in the shower? Click here to return to the main page for Quebec.